I was in third year high school then, so I could no longer remember what traits I wrote down. (I can’t even remember who I looked up to the most during that time!) But the lesson I learned that day would be impossible to forget. The speaker got a volunteer from the audience to share her answers with us. After the volunteer recited the three traits, the speaker pointed out how all those traits were possessed by the person through his decision and commitment. They weren’t traits that he was naturally born with, or special circumstances that give him the advantage over others. Even when I asked around, I realized nobody wrote “rich,” “smart,” or even “talented” and “genius.” The traits my peers and I wrote were “loving,” “passionate,” “has integrity,” “hardworking,” “honest” and the like—traits anyone could have—even ourselves. There were many more nuggets of wisdom my friends and I got after we attended that talk. But that was my favorite. I no longer remember exactly how he said it, so this is me just paraphrasing his talk from bits and pieces I recall. The most important lesson I learned from that demonstration is that even as we put some people on a pedestal, the traits that make us look up to them are the very same traits we could strive to have. It speaks so much of how much our choices and our willpower come into play whenever we want to achieve something–even having the very traits of the person we look up to the most. You could tell that a speaker is really effective when a room full of restless, vacationing teenagers talk about his message long after he has left the room, and share what they learned even with those who weren’t able to attend the talk. That was when I understood why this particular speaker is so popular and sought-after. My mom’s library is lined up with his books, and she collects newspaper clippings of his weekly column. My dad turns up the radio’s volume whenever the speaker’s commentary comes up. There was just so much to learn from him, and more than that, he practices what he preaches. His life itself is a testimony of the values he teaches. That speaker’s name is Francis Kong—a public speaker, a lecturer, and a business educator. Flash forward to three years later, I found myself seated in front of him, in a coffee shop aptly named Cup of Faith. I was ready with a set of questions for him. I had heard him speak before—in person and on the radio, and I’ve read some of his works (newspaper columns neatly cut and filed by my mother). But even then, I still had so many questions. After all, there are some things we believe that seem so commonsensical—but they are not the best way of seeing and doing things. 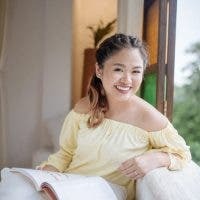 Francis Kong always has a fresh, out-of-the-box mindset, and in that interview, I learned many helpful things that surprised me. Example: One shouldn’t simply strive to be “the best that he could be.” Another is this: in order to be productive, one shouldn’t focus on time management. These are the eight new things I learned from Francis Kong. This is something that has always been taught to many of us: maximize your potential–be the best that you can be! Francis explained that you shouldn’t aim the best that you can be, because you can always raise the bar even higher. “I’ve managed about 300 plus talks and I haven’t slowed down,” he shared when I asked him about how he gets (so many!) things done. Because succes is not a destination point. Instead, strive for progress. Photo from Francis Kong’s Facebook page: Francis Kong with his son Bryan, wife Lilia, and daughters Rachel and Hannah. As a follower of his social media accounts, I’ve always been very curious how he manages to “balance” everything. He has posts about his numerous talks and seminars–both locally and internationally. He has posts with his family, posts about things he learned and quotes he heard from others, posts about his travel adventures with his family, and many more. (He even has posts about coffee and food!) How can anyone manage to balance professional life and personal life like that? This is the statement that surprised me the most. I know many people, myself included, who find it so hard to manage their time. Francis said, “I don’t manage my time, I manage my tasks.” He shared how he prioritizes tasks that would add value to his success goals. Among those goals are his goals for his family. Maybe the secret of being more productive is not really getting things done in the least possible amount of time, but choosing wisely which tasks are the most meaningful ones and most worthy of our time and effort. Photo from Francis Kong’s Facebook page: Francis Kong with his wife Lilia Kong, whom he fondly calls ‘The Ilocana.’ He explained to his curious followers on Facebook that ‘The Ilocana’ is a term of endearment for them and means something special in their love story.